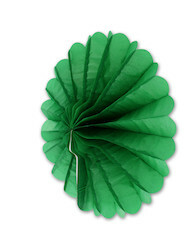 These green tissue fan decorations hang down over tables, over walkways and around doors. Simple to put together and hang. Decorations come in green only. There are 12 fan per bag. Each fan opens up to 14 diameter.